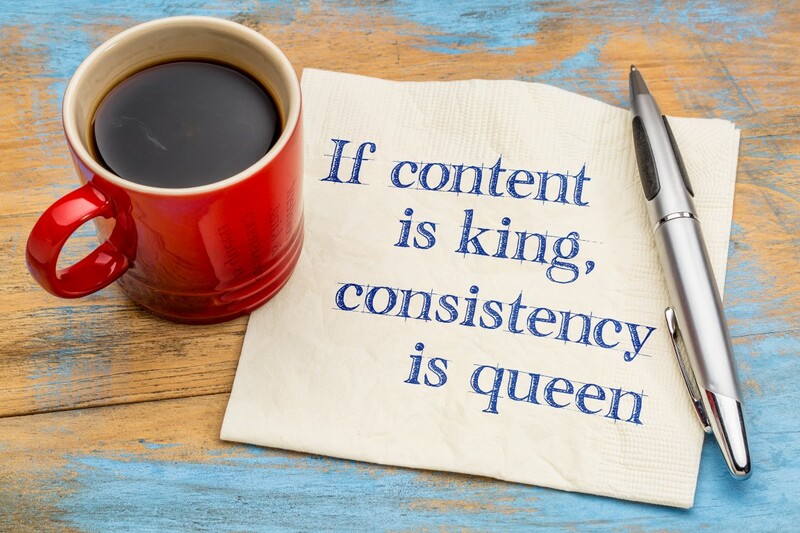 This perfectly describes the purpose behind my post today – to illustrate the importance of consistency in your blogging process to get the most value you can out of each one. At MayeCreate, we consistently follow an extensive workflow from start to finish to milk every post we publish for all it’s worth, one we’ve found it to be extremely effective in strengthening our online presence and bringing in quality website visitors. So, if you want to take a post out of our blog (Ha! Page…Book…?? You get it..), feel free to read through our formatting practices and adjust your process accordingly. How current is the post? If it’s from, like, 2006, move on. A lot’s changed since then. I personally try to look at posts written within the last 2 years depending on the popularity of the topic to stay on top of what’s out there. What important information did they include? 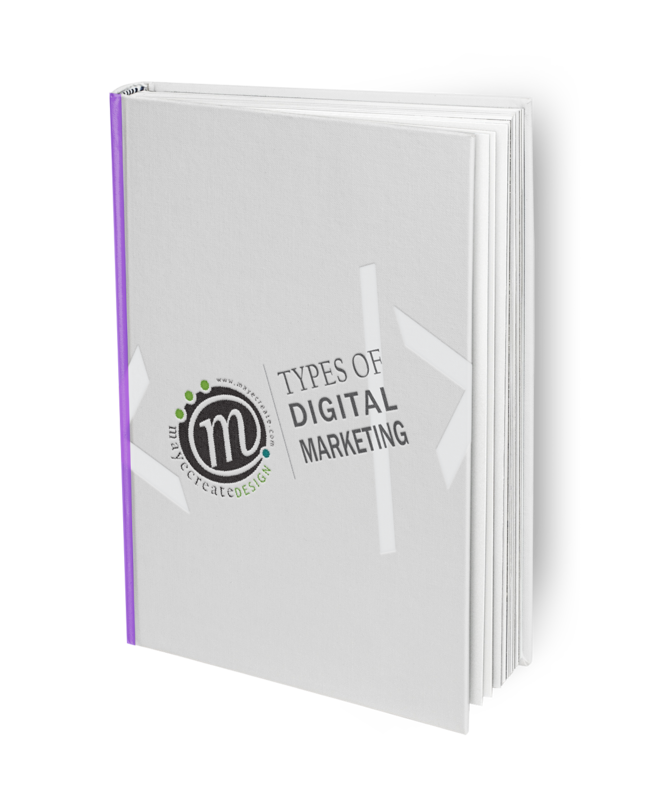 This can help you understand what’s relevant to your topic as well as what people are searching for online. How did they segment the information? Steps, reasons, pros & cons, bulleted and numbered lists, comparison charts, graphs…all examples of ways many writers organize blog post content. Seeing the way other experts segment content can get your juices flowing on what would work best for your topic. Keep in mind it’s not necessarily what you do but how you do it, so whether you take a standard approach, mix and match, or invent your own way, do whatever marries well with your content. What kind of supporting evidence did they reference? Did they use statistics to illustrate their points? It’s possible they used a case study or drew from their own experience in the industry as supporting content. Research your topic to see what’s out there and would work well in your topic. Check the source’s website to gauge credibility. Sources like HubSpot, Forbes, Smart Insights, and Business2Community are legit and typically offer more resources that might be more applicable to your topic. Make note of interesting points and resources you find as you do your research, and as you bookmark key references, share them on your social media accounts if you think your followers would be interested. This not only gives you an opportunity to connect with others in your industry, it’s also a great way to “document” your links for later in case you need them. The points you’d like to cover in your post. Supporting arguments and references for those points. Ideas for possible imagery, statistics, blog posts you’ve written and website offerings you’d like to feature within your post. This helps get all the “big picture” stuff out of your brain and organized on your screen. And if you’re half as visual and organizational as I am, you’ll find this process extremely cathartic. Don’t be afraid to take it a step further by letting ideas for future blog posts come to you during this part of the process. Just don’t forget to write them down. That can happen sometimes. Time to get it all out. Why, the rough draft of your blog post, of course! Once you’ve got your outline, start free-writing. Don’t worry about grammar, punctuation, or sentence structure. Just type the words and phrases that come to mind about your topic, making some conscious attempt to keep your flow in line with your outline. Consider doing your free-writing in Microsoft Word if you have challenges with spelling and grammar; it offers the best spell-checking features. More of a Google Drive fan? Me too. If you’d rather create a Google Doc, go for it. It has the same spell-checking features, so… Po-tay-to, Po-tah-to. Then there’s always the free version of Grammarly to help you with spelling and grammar. You just have to create a free account and copy and paste your content into their editing platform to see what needs correcting. Try to shoot for a minimum of length 200 words. Many experts advise keeping it around 500 words max in length. Our philosophy lately is it doesn’t necessarily hurt to have more words. Some of our more meaty posts far exceed the 500-word recommendation, but they’re chalk-full of so much information, they should continue gaining momentum on search engines for some time. Regardless, the really long detailed posts can be a beast to tackle, so 500 words is a good place to start if you’re not looking to be eaten alive by this whole process. Be sure you begin your article with an overview of what you’ll be discussing. This tells your reader what’s in it for them if they read it. Think “inverted pyramid”: if they only read this one paragraph, would they take away the right information? Your post title should introduce the reader to your topic and create a sense of urgency to compel them to read it. Remember, each blog post on your website as an additional “door” your online prospects can use to get into your website, so give them a title they absolutely have to click. One of my favorite tools for whipping up a great title is StoryBase.com. With this platform, you submit keywords related to your topic and get a list of searches performed each month pertaining to those words. It basically tells you which phrases and questions about your topic are the most searched for online. Feel free to check it out. As far as looks go, be sure to capitalize each word of your title that’s not a connecting word and all words over five characters. For example: Capitalize Each Word that is Not a Connecting Word and All Words Over Five Characters. If that doesn’t float your boat, that’s alright. Whatever you decide to do, just make sure all of your titles are formatted consistently in the post you’re writing and in all other posts on your site. You may consider making yourself a cheat sheet for this. Include a closing paragraph to sum up your article by restating your “thesis,” so to speak. Also, let your readers know where they can go to find additional information they may find interesting by providing links to other blog posts you or other experts have written. If you offer any related downloadable content or offerings on your website, include links to those here to keep your readers engaged with your company and moving through your website. Even if you’ve got some stuff in the works, this is a great “Coming Soon!” opportunity to introduce what you’re working on and build up some hype. Now you can begin shaping your post into a well-polished piece of online material your readers won’t be able to resist. To get started, copy and paste your draft into a new draft in WordPress and begin formatting your content. As you go through your initial draft, look for opportunities to provide valuable information as subheadings, bulleted or numbered lists, and bolded statements. Refer back to your outline to reacquaint yourself with the most important information you’d like to highlight if you need to. Again, just another way to get the good stuff to stand out. Break your content into shorter paragraphs to make your content easier to digest. Try to keep them each 4-5 sentences in length. Cause people are busy, ya know? Do them a favor and be concise. They’ll thank you for it. Once you’re done, go back through with objective eyes and ask yourself, “Is this something I would want to read? Does it look too busy or text heavy?” If the answer to these questions don’t align with what you’re going for, go back and rework what you’ve got to be more in line with your goals for the post. Including a subheading every two or three paragraphs helps break up your text so readers can easily jump to the information they want most. If subheadings are incomplete sentences or just a few words, format them they way you would your page title. If your subheadings are a full sentence, you’ll punctuate and capitalize them the way you would a sentence, unless it’s a question, in which case you’d format as, you guessed it: a question. Easy peasy. Whichever format you choose, be consistent with your headings! One of my biggest pet-peeves as a reader is seeing things like headings and bulleted lists formatted differently within one post. Don’t forget to use H-tags for your headings so they stand out visually and help boost SEO. If you’re featuring videos within your post, make sure they’re 560 pixels wide and embedded from YouTube. Why? Rather than rattle off all of the pros and cons, I’ll let the experts over at WPBegginer.com explain. As for pictures, well, there’s a lot to consider here. You’ll definitely want to add some relevant yet intriguing imagery to your post. You can use stock photos for this or take your own screenshots and pictures. If you’re using photos or screenshots to support your writing, take advantage of the captioning abilities in WordPress to help elaborate on your points. It’s just good SEO practice. Images shouldn’t ever link to a larger image unless they need to display greater details (i.e. graphs, infographics, etc.). If you’re linking a photo to an outside source, make sure the link opens in a new tab as an attachment file, NOT another page. You don’t want to shorten the time your readers spend on your website by sending them somewhere else, right? Title your images in a way that makes sense and is descriptive of the image subject. The image title should also be cohesive with the keywords and content on the page where your image lives. Then use the Alt tags to reinforce important key terms you’d like to show up for to help you rank better on search engines. All images featured in your post should be formatted to the same width and height if possible. And if most of the images are horizontal, stick with using horizontal images throughout your post. If you are using photos and/or charts from another source, credit the images in the caption and link to its original source. Don’t EVER steal images from Google, it’s not okay. There is a “labeled for reuse” setting you can select to see what’s available on Google for public use, but even then it’s a crap shoot. You’re free to jump onto some of the free stock photo platforms out there but you have to be mindful of the labels for commercial use on every single image you download. Some have editorial restrictions. If you’re taking screenshots of websites to use within your post, be sure to link the images to the website you got it from. Again, make sure the website opens in a new tab. What are the main keywords of your blog post topic? For instance, the keywords for this one would be “how to write a blog post.” Your keyword(s) may just be one word, maybe two words, a phrase or a question. Whatever the case, optimize your page by using them within your page (blog post) title, the meta description, your headings and subheadings, and content wherever possible. At this point, it’s time to go through and make sure there aren’t any spelling or grammar errors in your post. If you’ve got Grammarly installed on your browser, you should be able to see the glaring mistakes pretty easily, even in WordPress. If not, you can jump over to their online editing tool and run it through for mistakes and suggestions. I know my writing voice doesn’t always match my reading voice, so I always read my posts outloud to make sure they don’t sound lame and actually make sense. 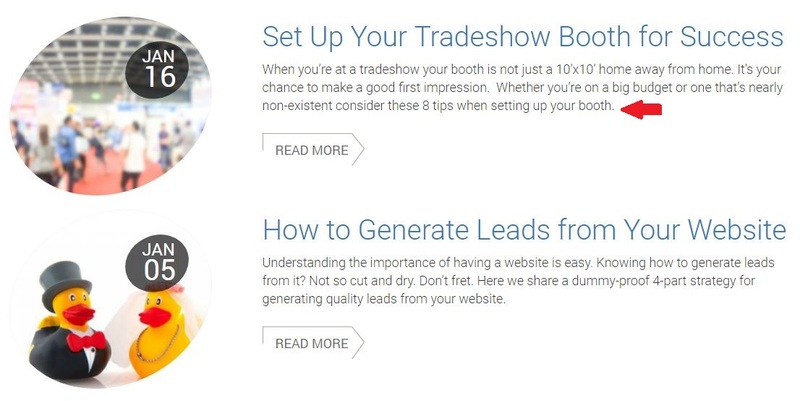 Earlier I talked about including downloadable content or website offerings in your closer. You can also feature ads at the end of your blog post to encourage readers to learn more about your website offerings. We use a WordPress plugin called AdRotate Pro to easily promote our website offerings on our blog posts and throughout our website. 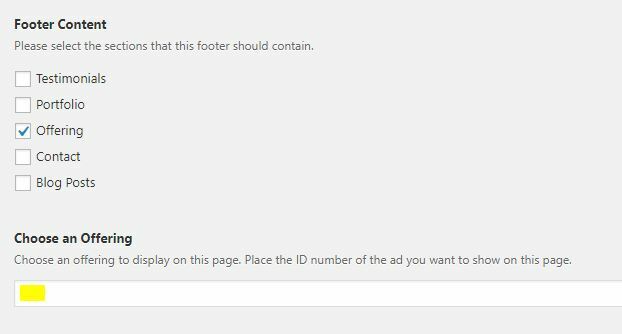 All we have to do is create an advert for the offering using the plugin and enter the associated advert ID into a custom field on the back end of the post in WordPress. Once it’s there, the ad shows up in the footer of the blog post on the front end of our site. Add a “Read More” tag. The red arrow indicates where the “Read More” tag was added within the blog post content, so the text pulled in to feature on the main blog page stops here. 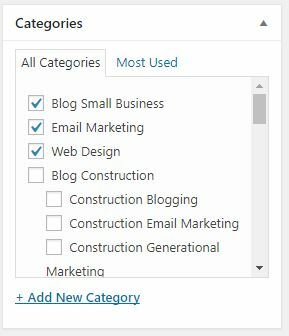 Whatever categories you have set up and whatever system you use to categorize your posts, make sure you select them before you publish so it behaves and/or appears the way you want it to on your website. This is what your categories section looks like on the back end of your blog post in WordPress. This is how blog post categorization looks on the front end of our blog. Without having the right categories assigned, our website visitors wouldn’t be able to find the post by sorting by category. That doesn’t mean it’s not there, just that it’s not as easy to find. Promote your posts on social media! To get the most out of each blog post you publish. To gain trust and respect from your readers by optimizing your content with the information they want most right up front. And how does all of this help your business? Lead generation. It may seem like a lot to put this kind of effort into each post, but once you get the hang of it, it won’t seem like much effort at all. Plus, following this process allows you to publish your post and then let it work its magic to bring people into your website. All you have to do is give it time the time it needs to gain momentum on the web. Now it’s time to take what you’ve learned and put it into action. 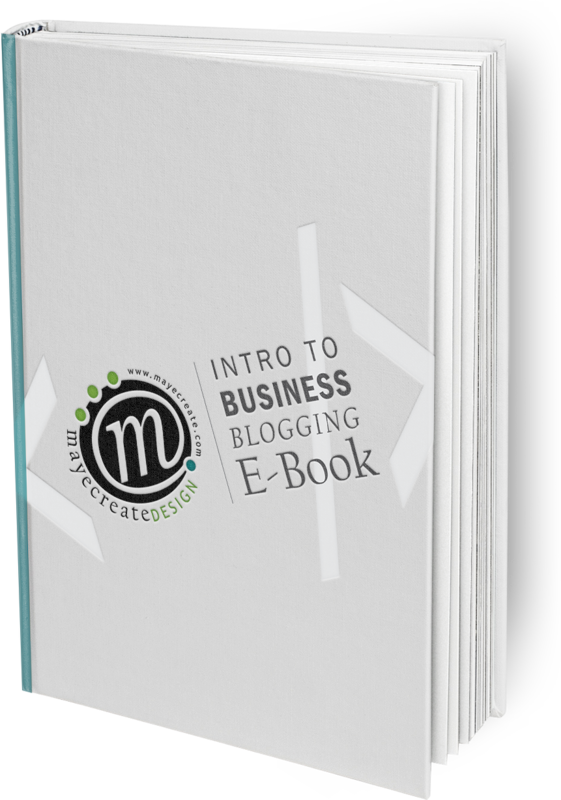 Don’t hesitate to bookmark this post if you need it to refer back to as you adjust your blog writing workflow. If you get stuck, we’re here to help.